Combining a passionate, doomed love story, a vivid evocation of life during the war, and a poignant mother/daughter drama, "Those Who Save Us" is a profound exploration of what we endure to survive and the legacy of shame. 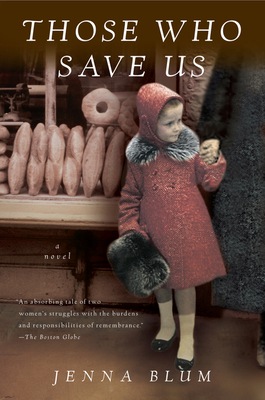 How would you categorize Those Who Save Us: as a war story, a love story, a mother-daughter story? Why? How is it different from other novels that address the issues surrounding the Holocaust? What new perspectives does it offer? Discuss the novel’s title, Those Who Save Us. In what ways do the characters save each other in the novel, and who saves whom? How does Blum play with the concept of being saved, being safe, being a savior? In the beginning of the novel, what is Anna’s attitude towards the Jewish people of Weimar? Does her attitude change? If so, where does this transformation occur and why? While she is hiding Max, Anna thinks she would “pay a high price to be plain, for her looks pose an ever-greater danger to both herself and Max.” Do you see Anna’s beauty as a blessing or a curse? What role does it play in shaping her destiny? How do her looks affect her relationships with Max, Gerhard, the Obersturmführer, Trudy? When living with Mathilde, Anna asks why Mathilde risks her life to feed the Buchenwald prisoners “when everyone else turn a blind eye.” Why does Mathilde take this risk? Why does Anna? Do you think American women would react differently than German women in similar circumstances, and if so, why? What are Anna’s sexual reactions to the Obersturmführer, and what effect do they have on how she sees herself? How do they shape Anna’s relationship with Trudy? Do you see Anna’s relationship with the Obersturmführer as primarily sexual, or are there places in the novel where their relationship transcends the sexual? Do you see the Obersturmführer as a monster or as human? What are his vulnerabilities? To what degree is he a product of his time? If the Obersturmführer had been born in contemporary America, what might he be doing today? Toward the end of the novel, Anna thinks that the Obersturmführer “has blighted her ability to love.” Do you think he has forever affected her ability to love Jack? To love Trudy? What are Anna’s real feelings for the Obersturmführer, and what are his true feelings toward Anna and her daughter? Are Trudy’s difficulties with her mother caused only by the secrets Anna keeps? If the past had not come between them, what would their relationship have been like? In what ways are Trudy and Anna typical of mothers and daughters everywhere? What parallels can you draw between their relationship and yours with your own mother? Trudy has been familiar with shame all her life, both her own shame and Anna’s. How does Trudy learn about shame from Anna? Does Trudy’s shame stem solely from her suspicions about her Nazi parentage or from her German heritage as well? How has her shame manifested in her adult lifestyle? Anna’s consistent response to Trudy’s questions is, “The past is dead, and better it remain so.” Why does Anna keep her silence? Is this fair to Trudy? Were you surprised that Anna refuses to talk about her past even when she has been confronted and deemed a heroine by Mr. Pfeffer? In her position, would you do the same? During his German Project interview, Rainer plays what he calls “a dirty trick” on Trudy by reading a prepared statement about his aunt’s experience and eventual deportation to Auschwitz instead of telling his own story. Why does he do this? Why is Rainer so angry with Trudy? Is he angry with her? Do you think his anger is justified? Why does Trudy get involved with Rainer? Is Trudy and Rainer’s relationship a healthy one? When Rainer departs for Florida, he says, “I do not deserve this . . . . I am not meant to be this happy,” a statement with which Trudy agrees. If Trudy and Rainer’s relationship were not affected by their wartime pasts, would it have been happy? Would it have existed at all? What does each of Trudy’s interview subjects-Frau Kluge, Rose-Grete Fischer, Rainer, Felix Pfeffer-represent about German actions during the war and how Germans feel in retrospect? What does Trudy learn from her German subjects? At the end of Those Who Save Us, the characters’ fates are ambiguous; Trudy, for instance, is left in a “vacuum between one part of life ending and another coming to take its place.” Why does Blum do this? What statement, if any, is she trying to make? Do you feel that the novel’s end is a happy one for Trudy? For Anna? Why or why not? And what do you think has happened to the Obersturmführer?